Come and ski Z�hradi�te in the evenings. Fully floodlit skiing from 4:00 � 9:00 pm awaits you. The 4 seater Buly Expres chairlift, P2 skilift and three ski runs with a 2 km total length are available to you. Free ski buses for evening skiing run daily from Bansk� Bystrica! 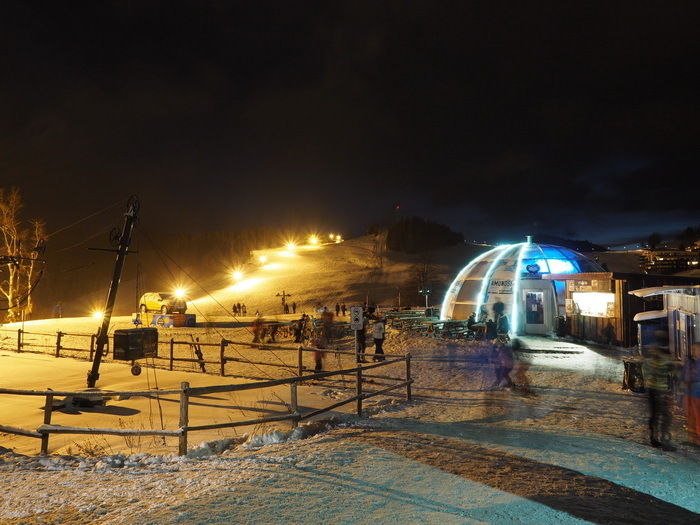 Since last season there is also the go floodlit evening skiing on the ski run by Lomena poma. It goes without saying that refreshments on the Z�hradi�te Snack Bar terrace are available during evening skiing. After finishing your evening skiing return to the Yeti Bar on the P1 skilift, from here it is only a few steps to the central car park and Koliba Dami�Snowsport where there is an automated machine for returning the deposit on your chip cards. Just to remind you that from this season when you to Donovaly for a long stay and buy a 5, 6, or 7 day ski pass that evening skiing is included in the price for normal daytime skiing. Likewise, season ticket holders do not need to buy an evening skiing ticket extra. The same goes if you have some unused points on your points ticket, use them for some great evening skiing.